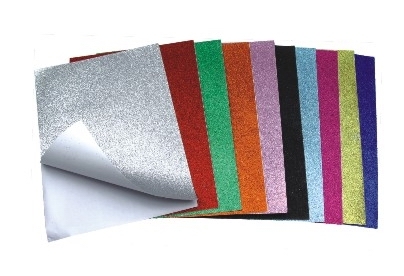 With just about a month to go until opening night and some big moves in free agency this offseason, the internet has been abuzz about the freshly painted buckets lined up for the 2014-2015 season. 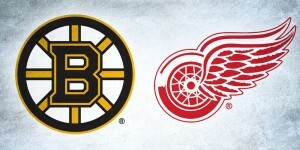 Whether because a goaltender has moved to a new team or just wanted a fresh look for the new season, let’s check out what new designs will be debuting this October. 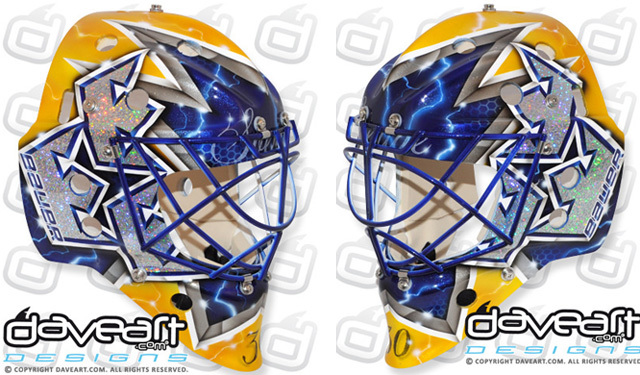 Artist David Gunnarsson of Daveart has had a busy summer crafting multiple new masks for goalies around the league. 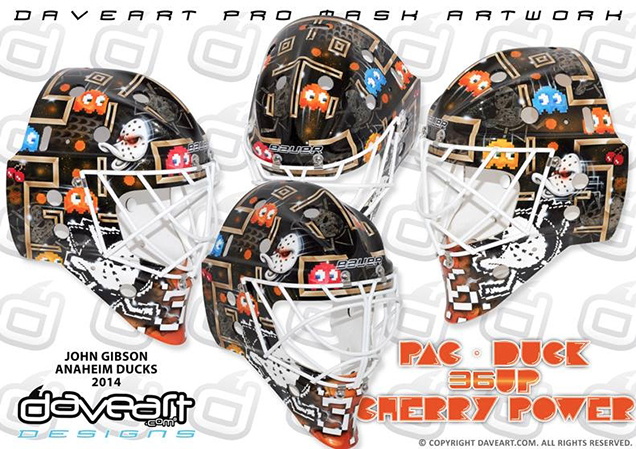 First up is John Gibson’s new “Pac-Duck” mask, paying homage to the classic Namco arcade game and hitting a bullseye of 80’s nostalgia. Aside from the fact that Gibson wasn’t born until more than a decade after Pac Man’s debut, this design has fun and youthful flair for the 21-year-old goaltender. In line with the recent trend of 80’s and 90’s motifs invading the sports world (the Ducks themselves had a throwback night honoring their “mighty” roots in the 2013-14 season) this mask sports a playful and eye-catching design. 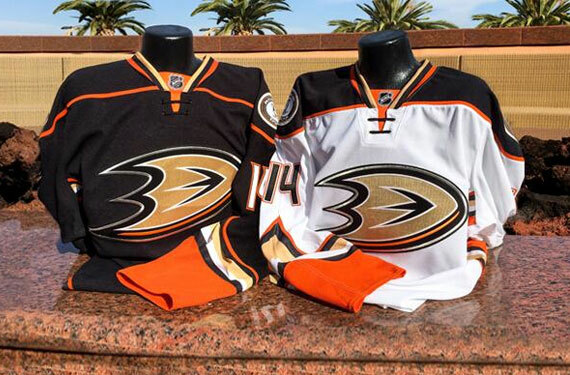 Despite being a bit busy overall (in true 90’s fashion) the black with orange accents will play nicely off both Anaheim’s new home and road jerseys. 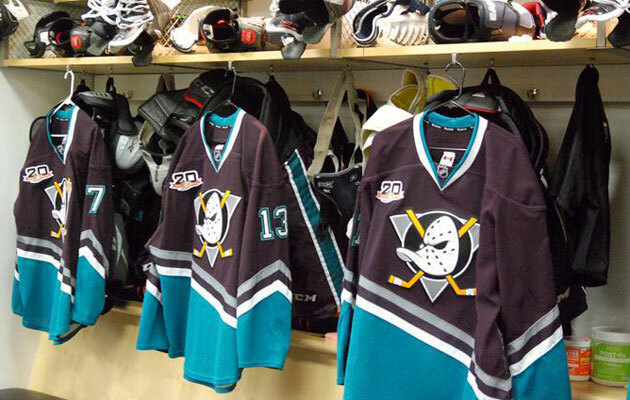 Gunnarsson also crafted a new bucket for Gibson’s Ducks teammate with yet another childhood nostalgia theme. 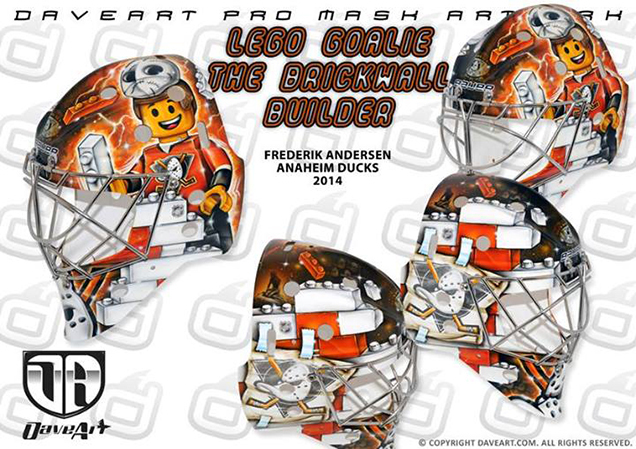 Per Gunnarsson’s facebook page, the “brick wall builder” mask features Andersen as a Lego-style goalie – a nod to his home country of Denmark where the Lego headquarters are located – playfully building a wall out of orange and white Lego blocks. The poster taped on the side pays homage to the team’s Mighty Ducks era, and additional Danish details like a mermaid and imagery of Copenhagen are incorporated throughout. 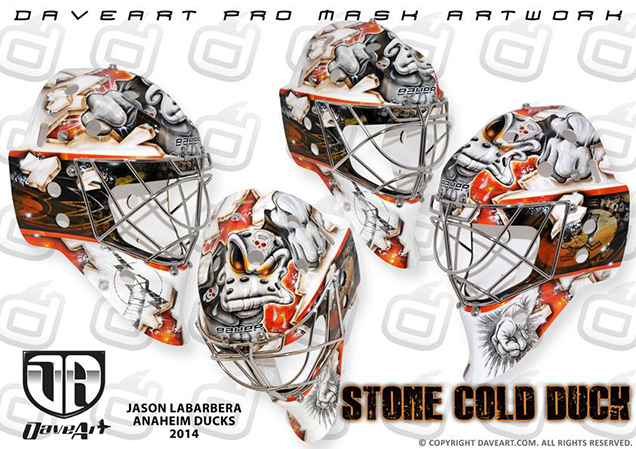 Rounding out Gunnarsson’s Ducks trifecta this season is Jason Labarbera’s Stone Cold Steve Austin-inspired mask. 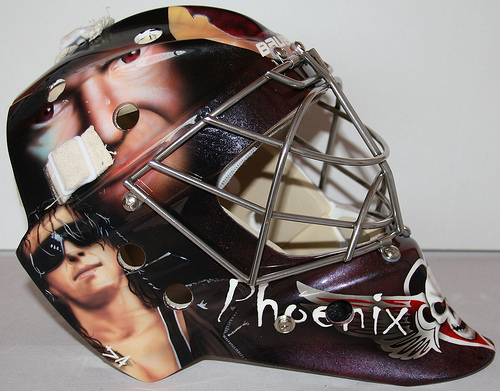 The big-time wrestling fan has featured WWE stars like The Ultimate Warrior and CM Punk on his buckets in the past, and even had a full-on Wrestlemania mask created when the event visited Phoenix. 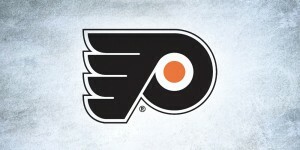 This season, Labarbera and Gunnarsson took a different approach to incorporating the wrestling theme by morphing one of Jason’s favorite wrestlers, Steve Austin, into a part wrestler – part duck creature. As Gunnarsson explains on his Facebook page, the duck has many signature characteristics of Stone Cold like the skull logo and breaking through glass. Grounding the design is a black band through the middle of the mask with the Ducks’ current and classic logos on each side. Like Gibson’s “Pac-Duck” mask, this design is a bit busy for my taste, but kudos to Gunnarsson for using his creativity in reinventing a theme that Labarbera has used time and time again. 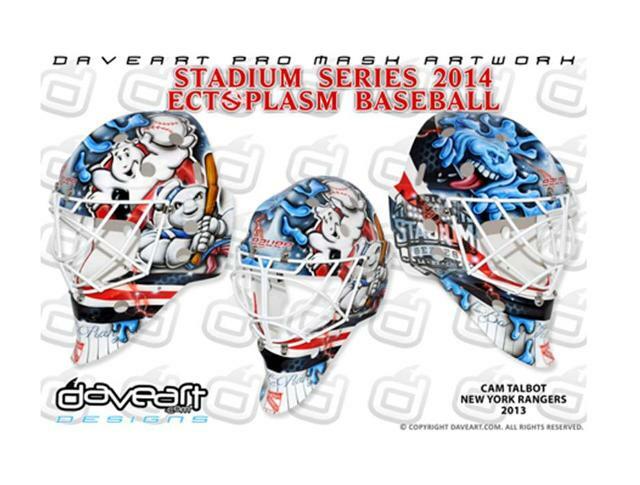 After Gunnarsson made Talbot a patriotic red, white and blue Ghostbusters mask for the Rangers’ 2014 Stadium Series appearance, Cam knew just who to call (bad Ghostbusters pun, I know) for his new 2014-15 regular season variation. 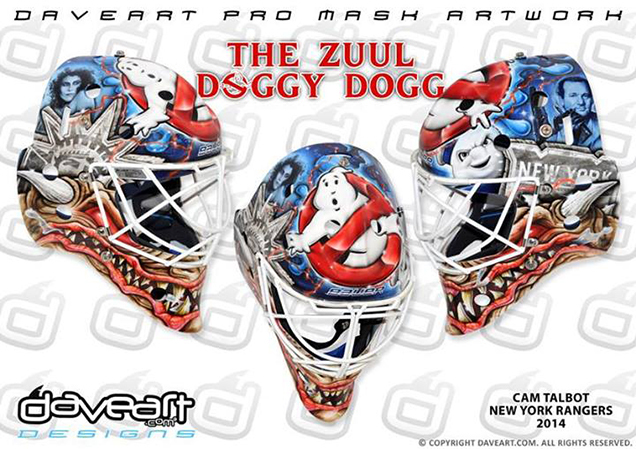 While the Stadium Series mask was still very Yankee-centric with the pinstripes, baseballs, etc., the new bucket is all Ghostbusters, even featuring the not-so-friendly Zuul dog around the chin. 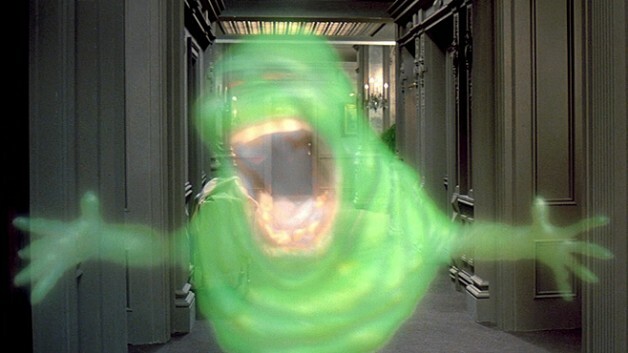 If Cam wanted to go all-out Ghostbusters, Gunnarsson certainly gave him that, but the overload of movie iconography detracts from the few bits of Ranger representation on here. 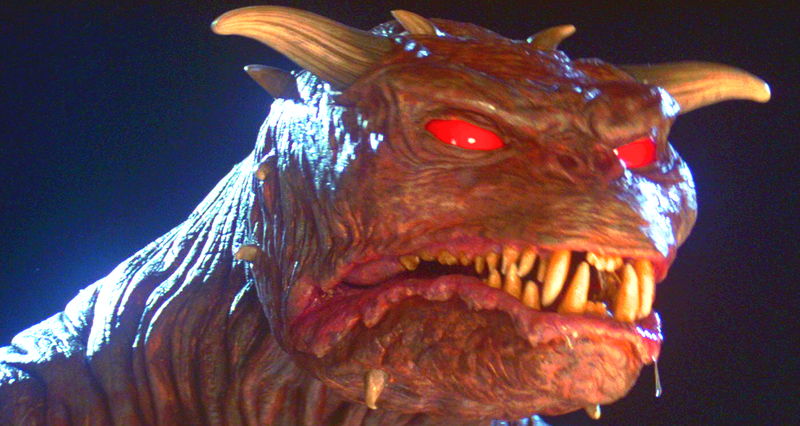 Both the Rangers logo and the Lady Liberty are desaturated and almost entirely cut off, an okay design choice by Gunnarsson, but they get lost in the clutter of Ghostbusters characters, colors and designs that take over this mask like Psychomagnotheric Slime. 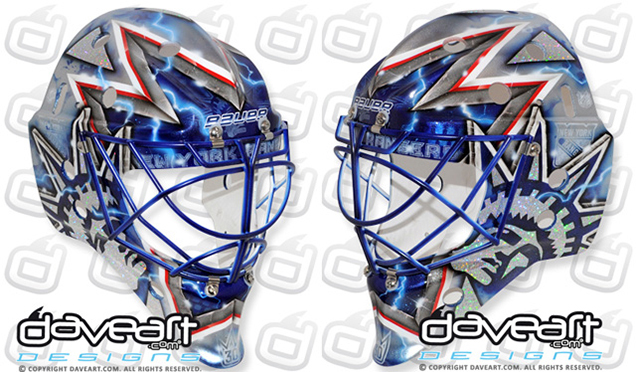 Talbot’s wasn’t the only new Ranger mask Gunnarsson created for this season. Long-time artist to King Henrik, Gunnarsson hasn’t strayed far design-wise on Hank’s masks over the past few years, but the subtle changes made for 2014-15 are very positive ones. 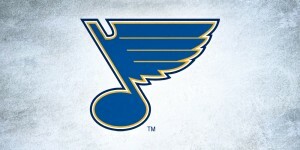 Per Gunnarsson’s blog, the crowns on Lady Liberty aren’t just symbolic for the Rangers’ home city, but with the small “30” crown on the chin, a nod to Hank’s (and Gunnarsson’s) home country of Sweden and its “Tre Kronor” (three crowns). This isn’t the first time the crown motif has found its way into Henrik’s bucket; his Team Sweden 2014 Olympic mask featured 3 large crowns on each side, centered by the trademark razors in cobalt blue. Using Lady Liberty’s crowns to reference both New York and Sweden is a nice subtlety, however I’ve never been a fan of the “hologram” treatment that always seems to creep its way into Hank’s helmets. The metallic effect Gunnarsson created around the razors is nice and clean, but the glittery Statues of Liberty distract from the beauty up top and overall make the design look a little too crafty. For sneak peeks at the other masks Dave is working on for this season (Niklas Backstrom and mystery netminders from the Panthers, Blues, Flames, Blue Jackets, Sharks and Islanders, just to name a few), check out his Instagram page. Stayed tuned for Part 2, coming soon! What do you think? What’s your favourite new mask announced so far? Let us know in the comments.